President Trump has let almost six months pass without holding a solo press conference. Now he's heading off on a two-week vacation with no immediate plans to meet the press. The lack of question-and-answer sessions is yet another example of Trump's disregard for the nation's news media and the role it plays in keeping the public informed. It's also a sharp break from past presidential tradition. Trump will reach the 200-day mark in his presidency on Monday. He has held just one solo press conference, back on February 16, when he was less than one month into his presidency. And though Trump has granted some high-profile interviews with outlets like the New York Times and the Wall Street Journal recently, he has done relatively few overall, which means journalists are rarely able to ask him questions on behalf of the public. White House officials frequently tout Trump's bypassing of the media via Twitter and Facebook, but he doesn't field questions from the public on those platforms. 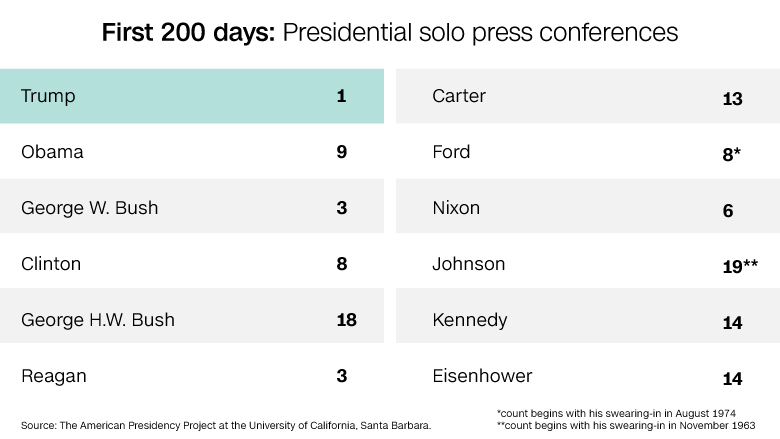 So how does Trump's presser record compare to his predecessors? At this point in 2009, President Obama had held 9 solo pressers, many of them about the country's economic recovery. At the same point in their respective presidencies, George W. Bush had held 3 solo pressers; Bill Clinton had held 8; George H.W. Bush had held 18; Ronald Reagan had held 3; and Jimmy Carter had held 12. The stats come from CNN's own data and the American Presidency Project at the University of California, Santa Barbara. There's an important distinction here between solo press conferences and joint sessions with foreign heads of state. Journalists value solo pressers because there are typically given more time to ask a greater number of questions. Joint appearances with foreign leaders usually only allow for a few questions, some of them asked by foreign media and directed at the other leader. Trump has held twelve of these relatively short joint press conferences, most recently on July 25 with the prime minister of Lebanon. The president frequently makes news at these events, but advocates for greater press access say they are no substitute for solo pressers. Obama and other past presidents sometimes scheduled press Q&A's in prime time to shape public debates and reach a large audience. Journalists came to anticipate Obama pressers before his vacations in August and December, though he didn't follow through every time. George W. Bush held a presser while on vacation at his ranch in Crawford, Texas in August 2001. The occasion was his nomination of a new chairman of the joint chiefs. A group of journalists will be staying near Trump's golf resort in Bedminster, New Jersey in case he'd like to speak. But his practices so far this year suggest that's unlikely. While the president seemed to greatly enjoy his exchanges with journalists at the February 16 event, he hasn't held another one since then. Some of his public events seem geared to his base of voters, rather than the American people as a whole, as evidenced by his most recent rally in West Virginia. Thursday night's rally was specifically directed at his fans, and it was carried live in full by Fox News, but did not receive the same degree of attention from other networks. The president spoke at length to his supporters, telling them that detractors are "trying to cheat you out of the leadership you want with a fake story" -- Russian meddling in the 2016 election, and the investigations into it -- "that is demeaning to all of us." He refrained from attacking the media specifically, potentially signaling a new strategy. But his top aides remain openly hostile to journalists, particularly when subjects like the ongoing Russia investigations come up. The strategy of speaking to supporters rather than the public at large has carried over to some of Trump's joint press conferences. He has broken with tradition by favoring friendly, conservative-leaning outlets on occasion, instead of calling on main line news organizations like the Associated Press and Reuters. 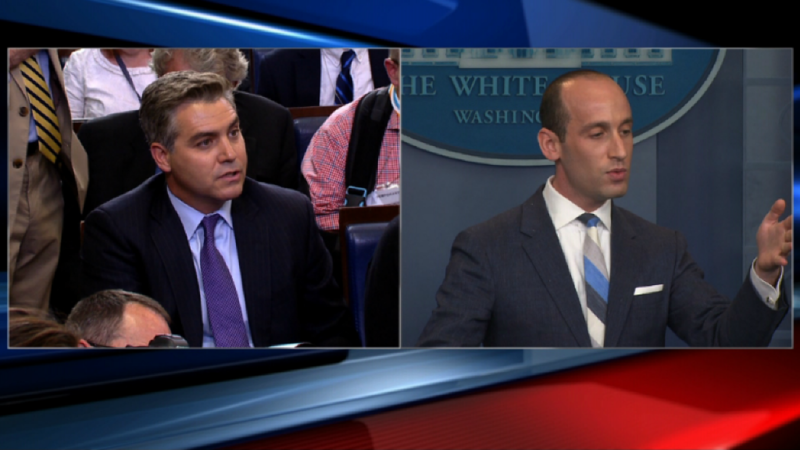 He hasn't been completely inaccessible, but the changes in frequency and format have been a source of frustration among White House correspondents. As CNNMoney's Tom Kludt has previously observed, "The last time President Donald Trump gave a solo press conference, Michael Flynn's resignation as national security adviser was only three days old. James Comey was still in charge of the FBI [and] the Republican bill to repeal and replace Obamacare had just been unveiled in the House of Representatives."